Prominent & Leading Manufacturer from Faridabad, we offer strip shear & welder. 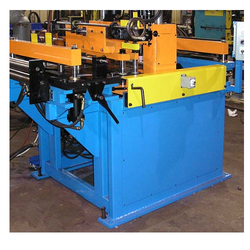 Keeping in sync with time, we are able to offer High Frequency Strip Shear & Welder to our respectable clients. The offered range of high frequency solid state welders is made utilizing high grade raw material and innovative techniques in strict compliance with the international quality norms and standards. Moreover, the offered range of high frequency solid state welders is suitably checked on varied parameters to ensure that defect-free products are delivered at customers' premises.The solid state welder saves energy up-to 25% as compared to vacuum tube welder. The solid state welder consists of two numbers of compact & separately sealed enclosures for power supply & oscillator section. Solid state thyristor in anti parallel connections are used for heat control. Alphanumeric digital display along with PLC is used to control the circuit of the welder. The component used are of very high industrial grade standard to give uninterrupted performance. Looking for Strip Shear & Welder ?